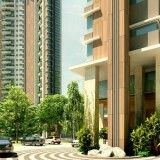 Provident group presents an upcoming project cited Provident Neora in North Bangalore. This residential project is located in Thanisandra. The development comprises of 384 apartments in towers of G+13 floors out of which 220 units are 1BHK apartments and 136 units of 2BHK spacious, opulent apartments in a residential locality in the city. The project is in close proximity to all the reputed educational institutions, health care centers, shopping malls, eateries, banks.